Durham Friends Meeting was set off as a monthly meeting under Salem Quarter in 1790, and was transferred to Falmouth Quarter in 1794. Leeds Monthly was set off from Durham in 1813, and Durham over saw a preparative meeting in the adjoining town of Lewiston until it, too, was set off in 1980. The records of Durham Monthly Meeting consist of minutes of the meeting for business since 1987 and newsletters from 1967 to the present. Older records for the meeting are held at the Maine Historical Society. At about the time of the American Revolution, a group of Quakers from Harspwell, Maine, migrated up the Androscoggin River to settle in the town of Royalsborough, now called Durham, and were soon joined by others from Falmouth, Me., and Weare, N.H. As early as 1775, these settlers established the Royalsborough Preparative meeting under the aegis of Falmouth Monthly, but by 1790, they were set off as a proper monthly meeting. Initially part of Salem Quarter, Durham Monthly Meeting transferred to care of the new Falmouth Quarterly Meeting in 1794, where they have remained since. 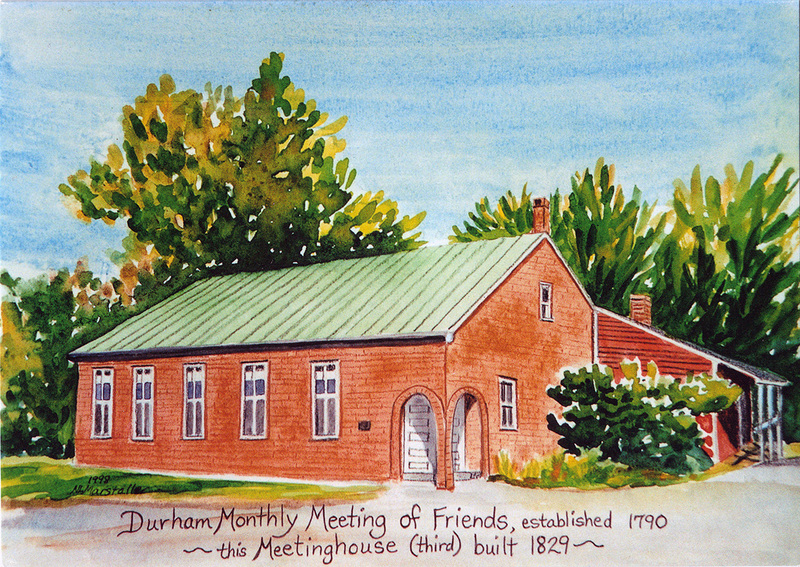 The first dedicated meetinghouse at Durham probably dated from about the time of their establishment as a monthly, when the meeting acquired three acres of land, however by 1799, this structure was already considered inadequate for the growing community. A new larger building that was constructed in 1800 was destroyed by fire in 1828 and replaced by a larger, two-story building completed in 1829, which still stands. Over the years, Durham has served as the parent for other meetings. Leeds Monthly Meeting was set off on its own in 1813, and Durham oversaw a preparative meeting in the neighboring town of Lewiston from 1867 to 1891, when it too was set off as a monthly. After Lewiston was laid down in 1911, its members were returned to Durham, however it was reconstituted in 1980. Lacking issues for Apr., June-De. 2002; Jan.-Mar. 2003. Lacking issues for Sept.-Dec. 2006; Jan.-Mar. 2007. Cite as: Durham Friends Meeting Records (MS 902 d874). Special Collections and University Archives, University of Massachusetts Amherst Libraries.